After our week out at Mae Jo Golf Club & Resort we then moved into the Ping Nakara in Chiang Mai city. It was nice to be close to the city happenings again. 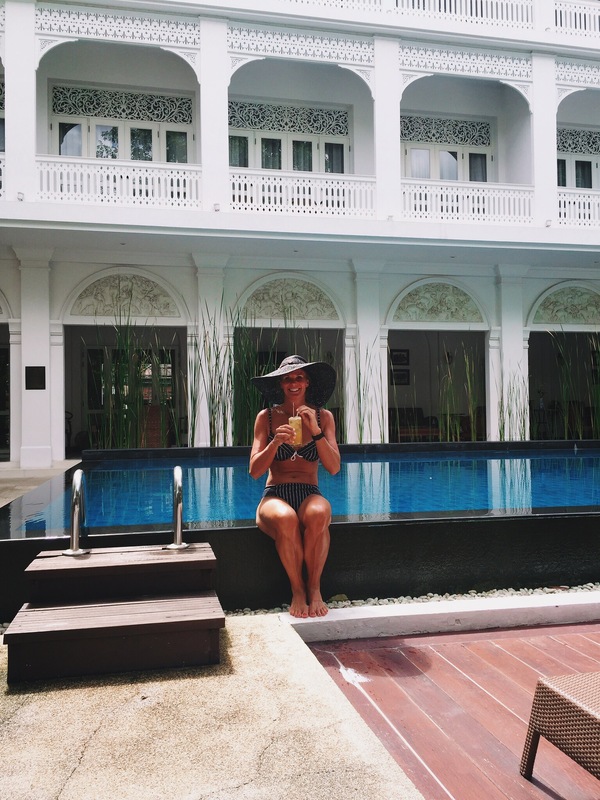 We have stayed at the Ping Nakara before and it is one of my favourite boutique hotels with only 19 rooms. During the reign of King Rama V, in the opening years of the 20th century, the area where the hotel stands was at the center of Northern Thailand’s thriving teak logging business. There were many beautiful colonial style buildings along this stretch of the river, among them the house of Luang Yonnakarn Phichitra and the British consulate, and these elegant forebears provided the inspiration for the Ping Nakara. 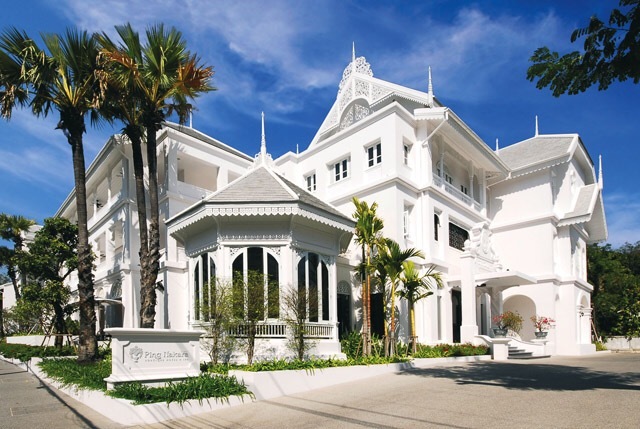 While the hotel captures the appearance and feeling of old colonial buildings in Chiang Mai and the North, it is far from being a simple reproduction. To preserve the essence of the past but blend it seamlessly with the demands of contemporary life required many original designs and creative re-imaginings. Three storey buildings in this style were all but unknown, yet by combining seven structures of differing heights and styles the whole feels natural. The fretwork patterns, beds, door knobs, window fixtures and furniture throughout are all of new design but inspired by and in keeping with historical antecedents. As mentioned above teak logging was the main industry and source of revenue in the North of Thailand, and much of it was administered from this locality. 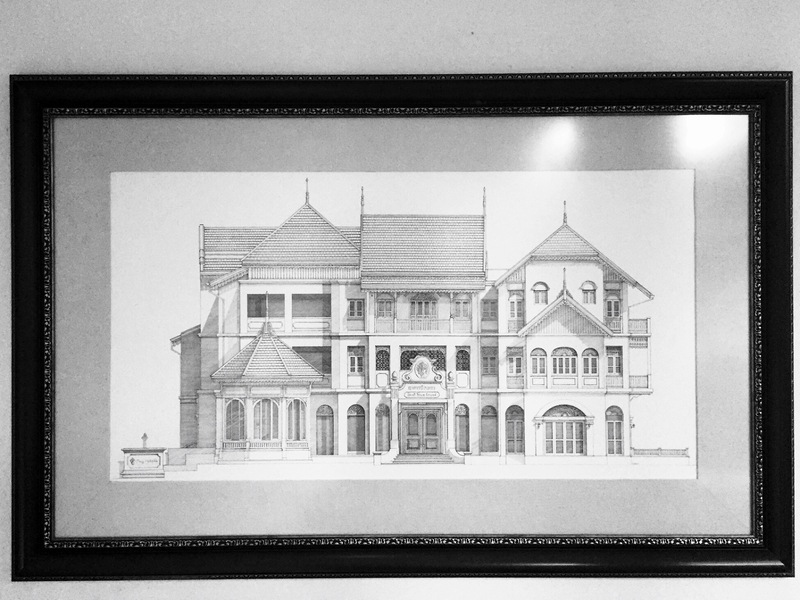 Where this hotel now stands, mahouts (elephant handlers) and their elephants used to bide time in simple wooden buildings while their bosses attended to business in the adjacent Forestry Office, the first such office in Thailand. For the elephants and their handlers this would often be the last moment of respite before an arduous month or more in the forest. It is only fitting, then, that construction of the hotel began in the year of the elephant (2007) and that this magnificent creature is an important theme throughout the hotel. The 16 bas-reliefs around the terrace present the complete story of the elephant and its close relationship with man, beginning with preparations for a journey into the jungle and ending with pulling teak logs out of the river. Outside of shows, this working cooperation between man and elephant can no longer be seen today. 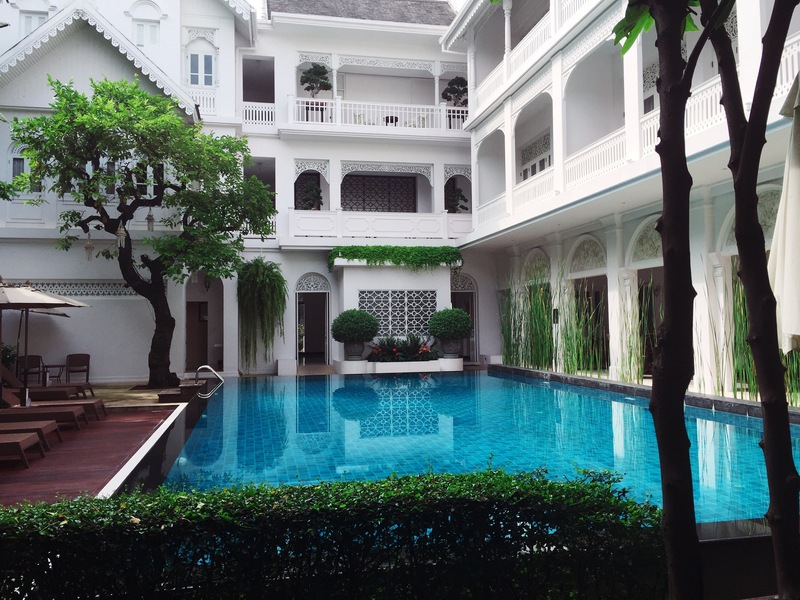 The attention to detail around the hotel mentioned above is evident and the staff are very friendly and courteous. The daily breakfasts are delicious and they top your mini bar up daily with local snacks and treats. There are many little alcoves for relaxing in including a library. They even gave us our own little momento when we left – two little ceramic elephants. Just around the corner from the hotel are some great little cafes where I enjoyed some very good coffee. It is also only about a ten minute walk to the Night Bazaar. 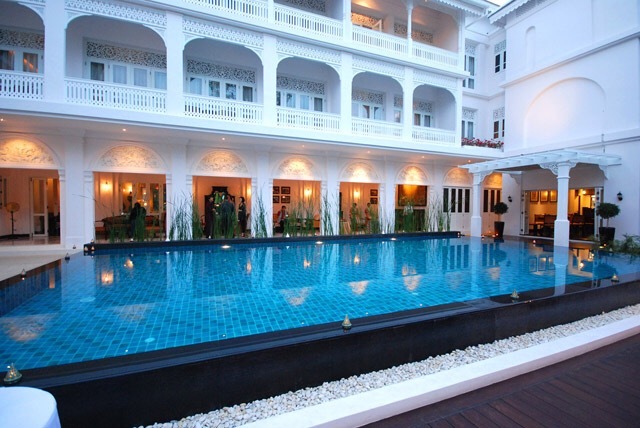 We highly reccomend this hotel if you are visting Chiang Mai. On the Sunday our Swiss and Thai friends (Daniel, Marc, Icy and Boom) that live in Chiang Mai invited us out for the day. 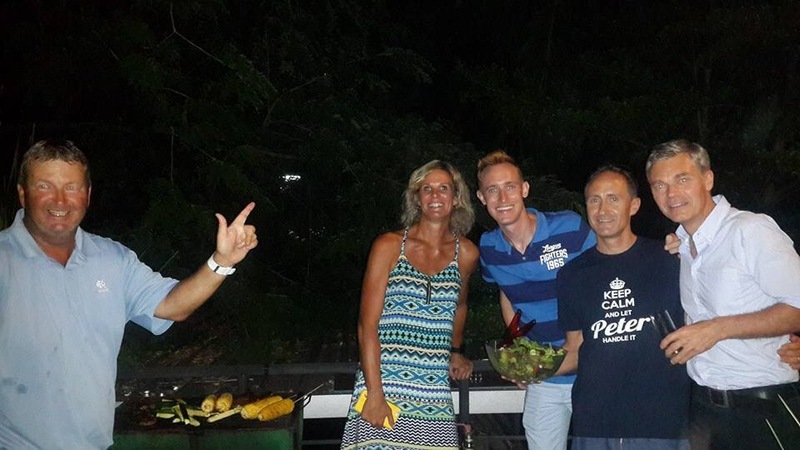 Regula and Dani from Switzerland were also in town so a day out on a house boat on the Mae Ngat Dam had been planned. 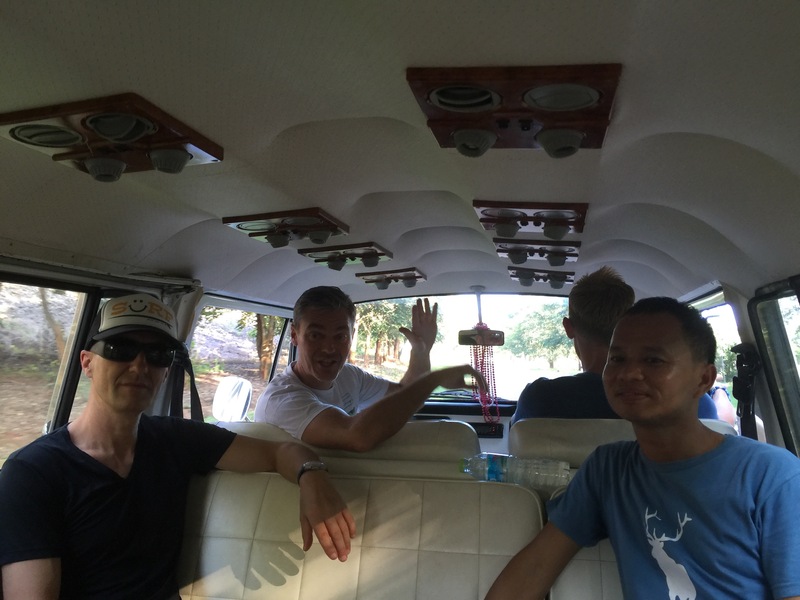 Steve wasn’t too keen but I certainly was so at 9.45am Noki (Daniel’s VW Combi) and the team pulled up outside the hotel to pick me up. 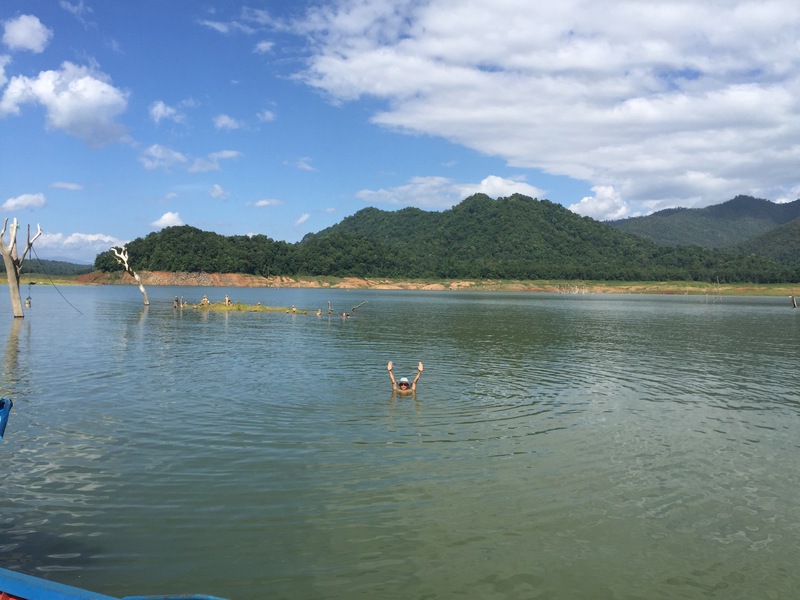 It took about an hour and a half to get to the Dam but it is always nice enjoying the scenery in Thailand from the back of Noki. 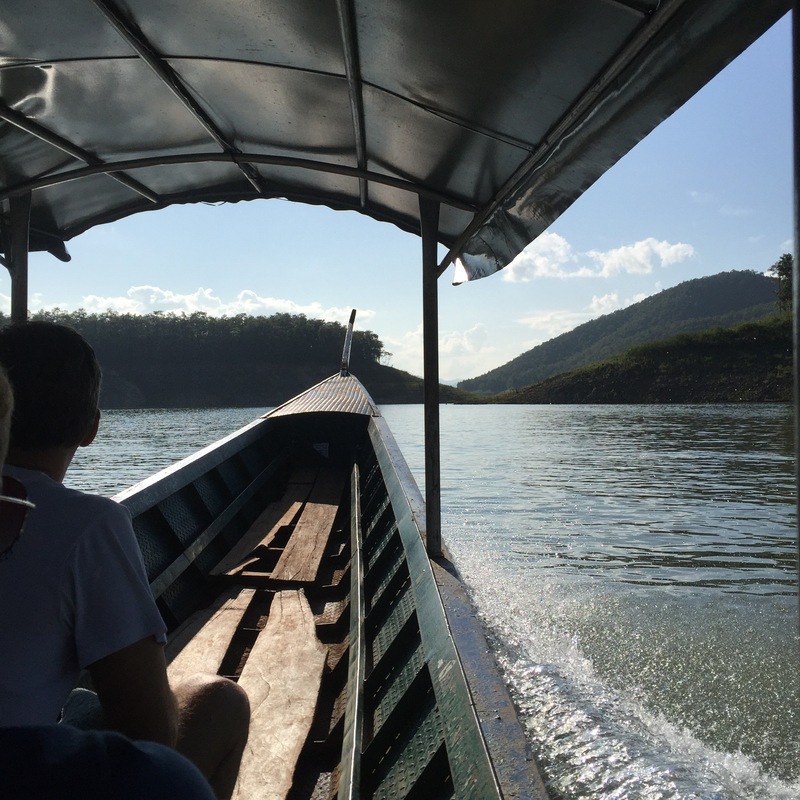 We then jumped onto a long tail boat and were taken out to a houseboat. 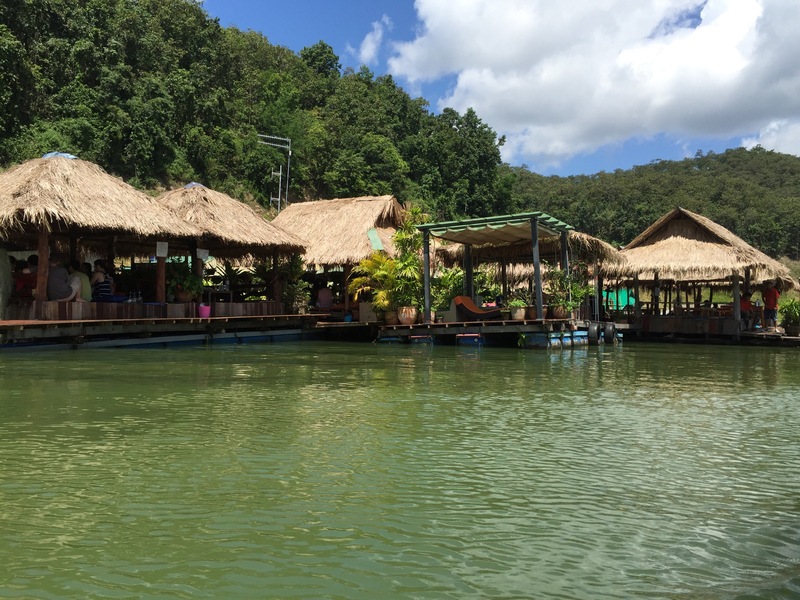 These houseboats are stationery and have restaurants, accommodation and water sport options. We picked our spot and settled in for the day. 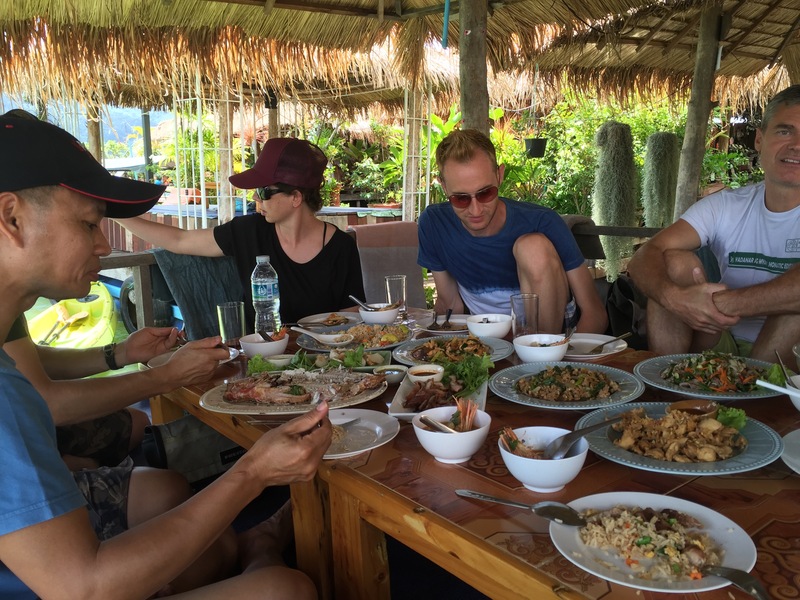 A nice long lunch of many Thai dishes was served along with drinks. After lunch most of us got into our togs and went for a swim – Marc & Boom took the chance to have an afternoon nap – something about too much beer the night before! The water was reasonably warm – not like the dams or lakes in NZ or Switzerland. The water is very murky but from what I read it is quite ‘clean’. Regula and I decided it was best we didn’t know what could be lurking beneath the surface! I only did the research below on the Dam after our visit – a good move! We spent about an hour in the water before it was time to pack up and head back to the carpark on the long tail. 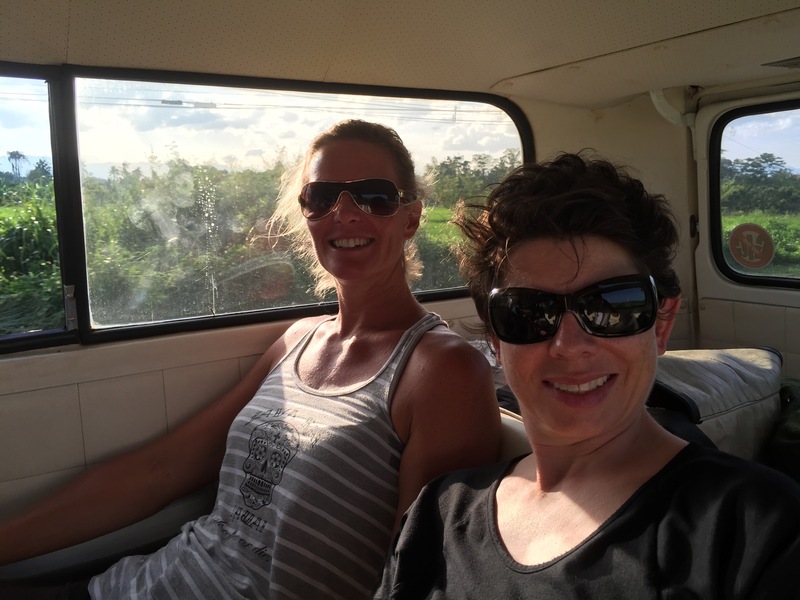 We came back to Chiang Mai via a different route so Dani could see some rice fields which are beautiful and green at this time of the year. It was a very enjoyable and relaxing day – a great way to spend a lazy Sunday. 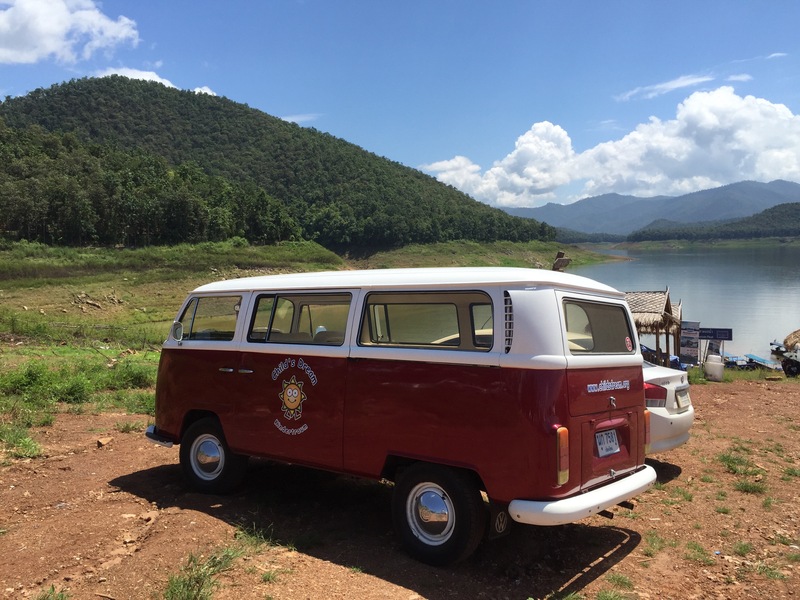 Situated in the Sri Lanna National Park, The Mae Ngat Dam and Reservoir is one of Chiang Mai’s best kept secrets. 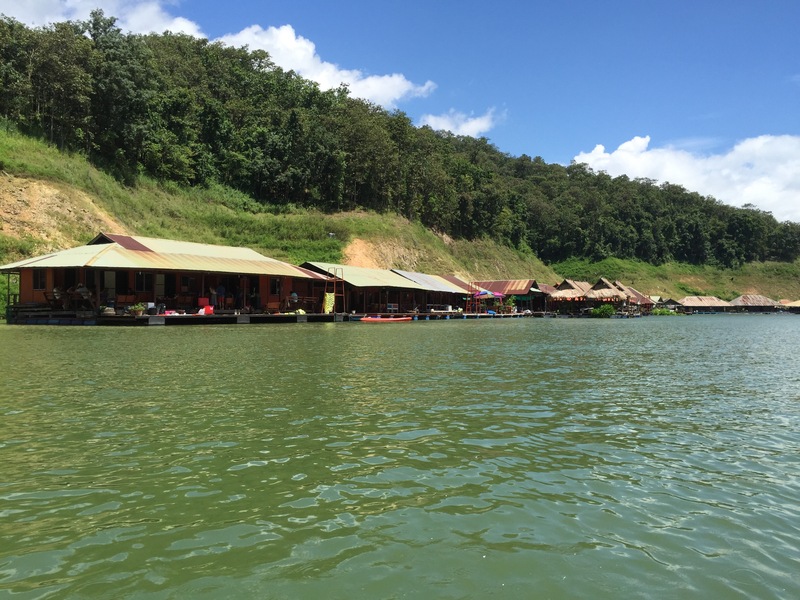 This enormous stretch of fresh water was formed when a Dam was built across the Mae Ngat river and flooded the valley. 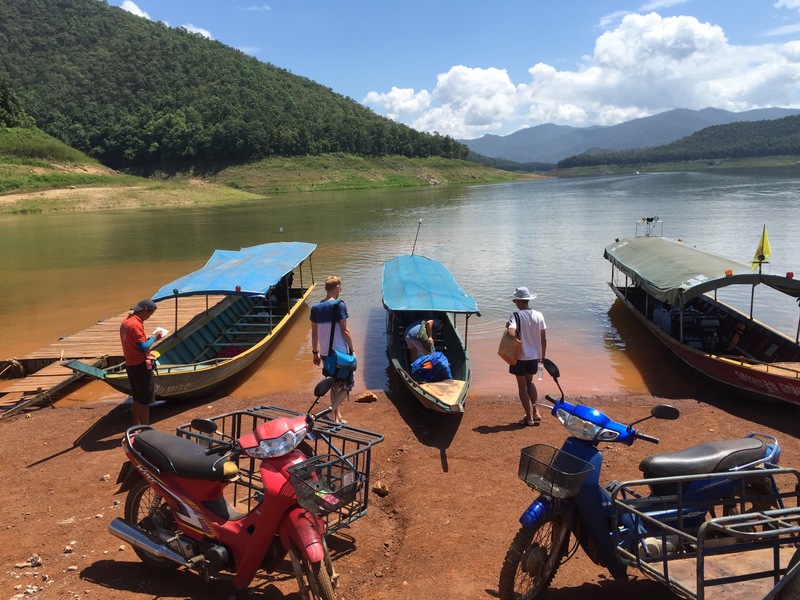 The Mae Ngat Reservoir sits between the Mae Ngat and Mae Taeng forests creating an idyllic spot to relax, swim or to fish. The reservoir has Giant Catfish, Jungle Fish and Indian Carp. 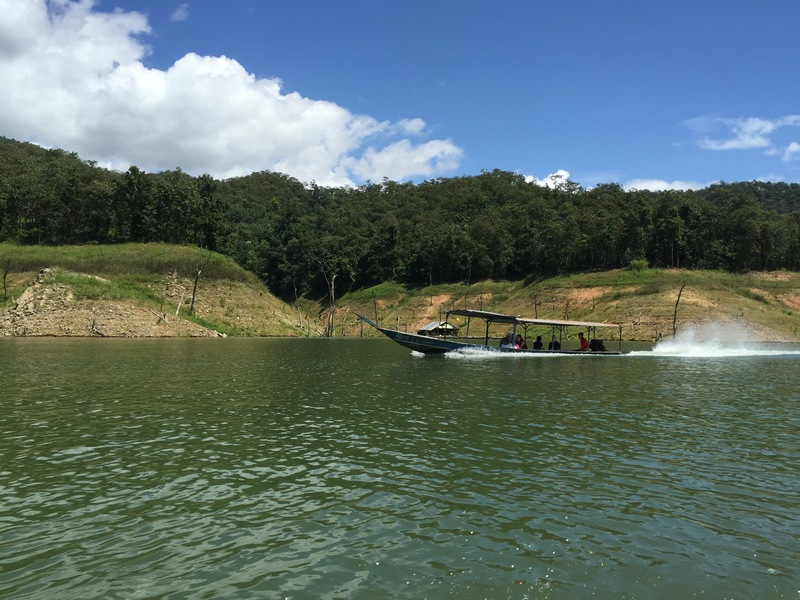 The reservoir has many tributaries and bays along its length and the surrounding forests are a haven for wildlife. 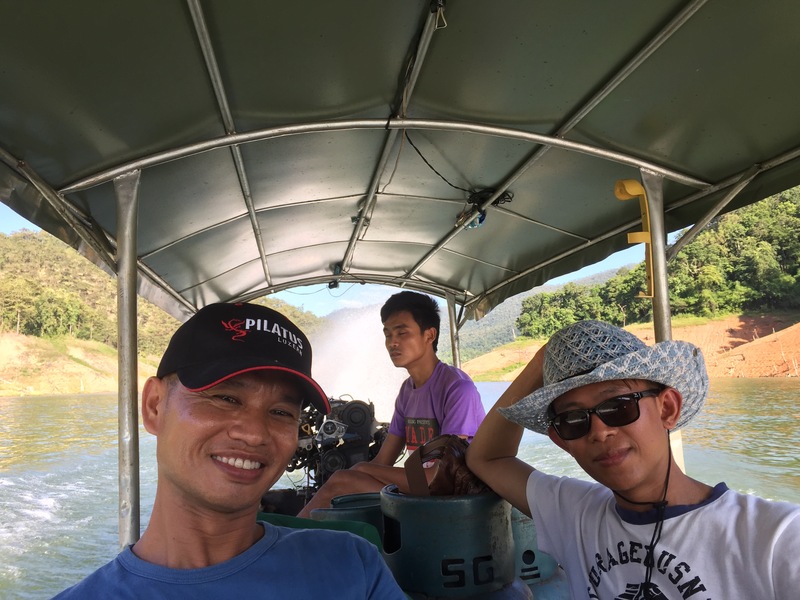 There are a number of Dams in Thailand that are used to generate electricity and provide water and irrigation to the farmers. The water level in these Dams is currently very low and given that the rainy season is nearly over this is causing major concerns throughout the country. On Monday night we went to Daniel and Icy’s place to cook a BBQ for everyone. 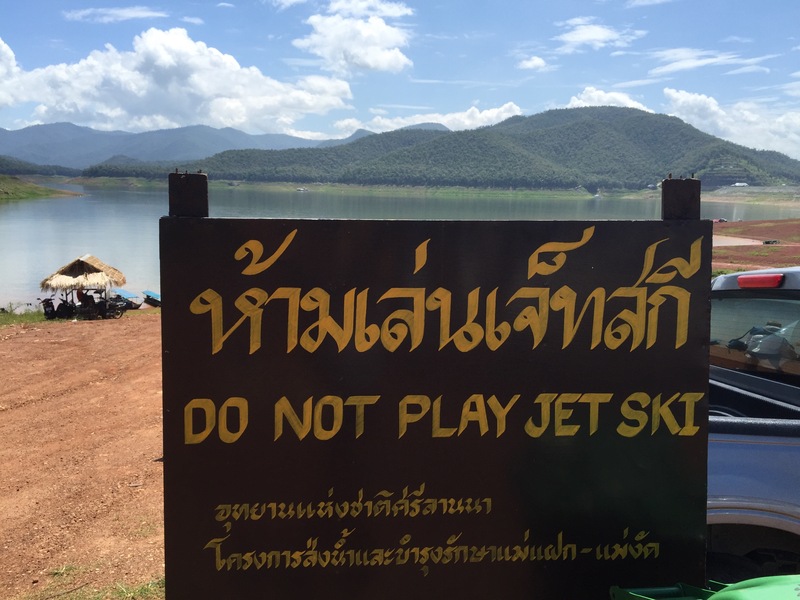 This has become a bit of a tradition on our visits to Chiang Mai. 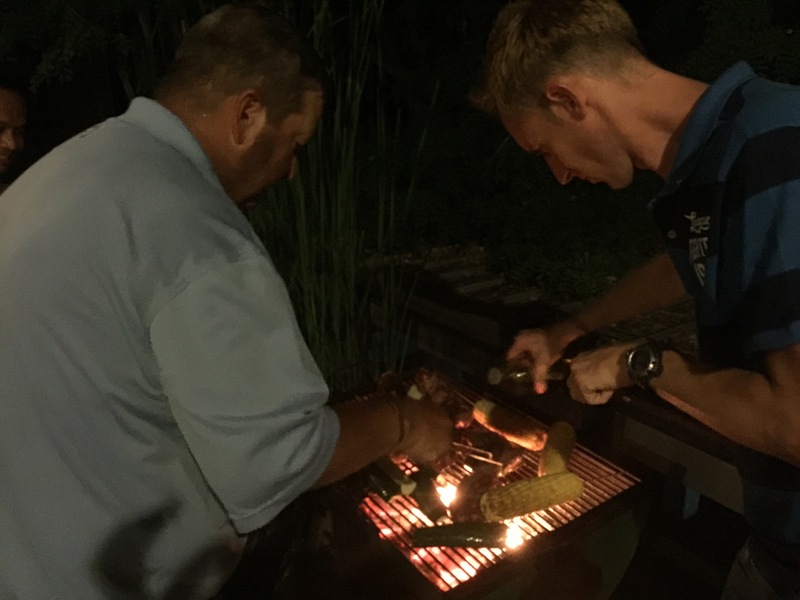 Steve’s BBQing skills are world famous here – no pressure! A trip to the supermarket yielded the popular pork loin and some NZ steak along with various accompaniments. 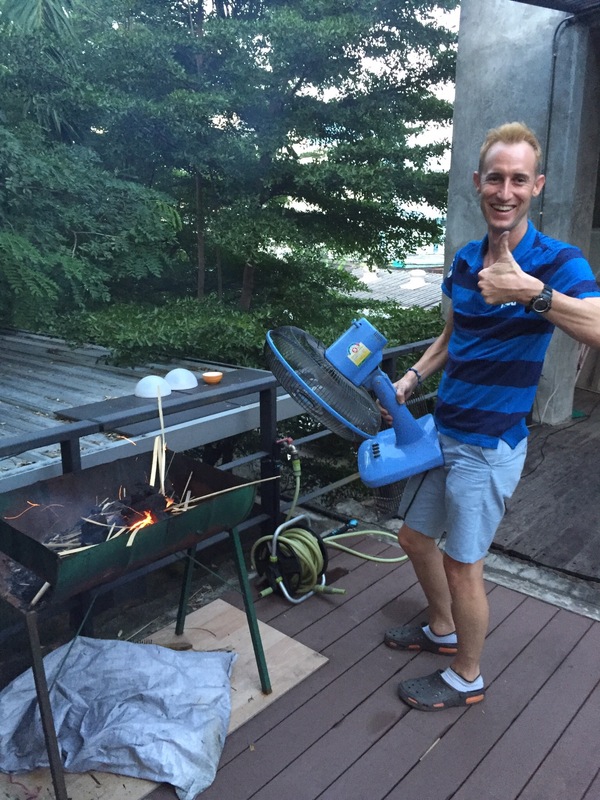 It was then all hands on deck – Daniel was getting the BBQ up to temperature using a bit of Swiss / Thai ingenuity – this is no fancy gas BBQ but a half gallon drum fuelled by charcoal and the good old household fan. I was on potatoes, Regula was on salad and of course Steve was marinating the meat. 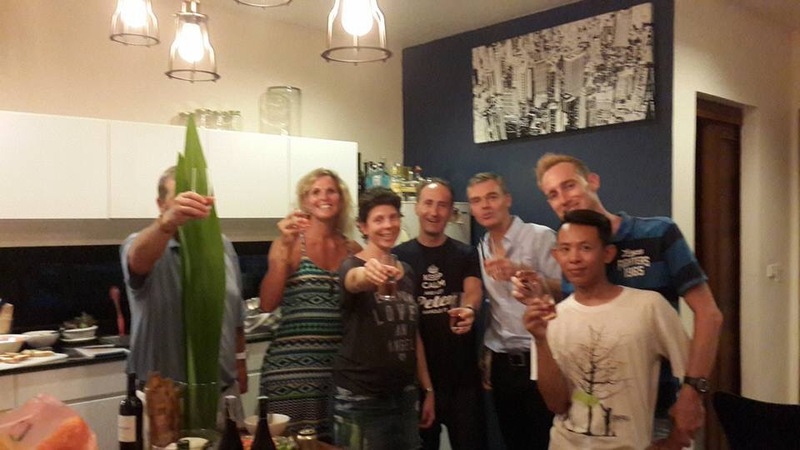 In amongst all this hive of activity the champagne was poured and a couple of birthday toasts made – Icy had turned 40 earlier in the month and Regula’s birthday was on the Friday just gone. Any excuse for champagne really! 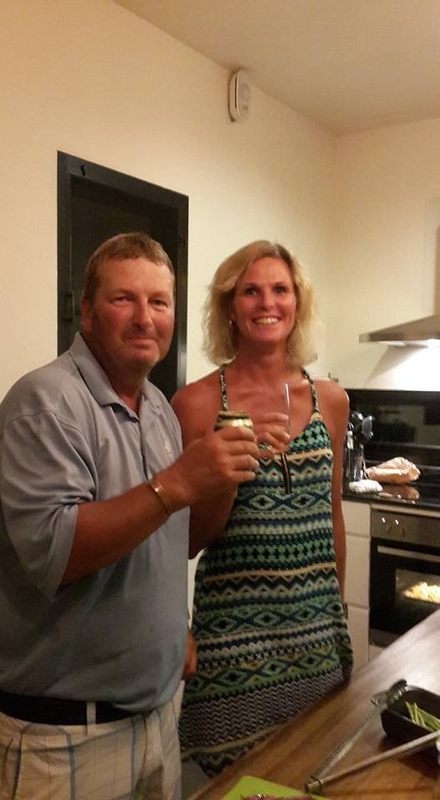 As with all Kiwi BBQ’s the chip and Kiwi dip was also in attendance – Daniel fell in love with Kiwi dip when he came to NZ so when we visit we try and bring a couple of cans of reduced cream and packets of onion soup with us – they are not easily obtainable here. It was a fantastic night with lots of laughs and interesting discussions. The boys are all coming to NZ next February and we can’t wait to see them again and show them some of our Kiwi hospitality. Chiang Mai is the largest and most culturally significant city in Northern Thailand. It is the capital of Chiang Mai Province and was a former capital of the Kingdom of Lanna (1296–1768), which became a tributary state of the Kingdom of Chiang Mai from 1774 to 1939. It is 700 km (435 mi) north of Bangkok and is situated amongst the highest mountains in the country. 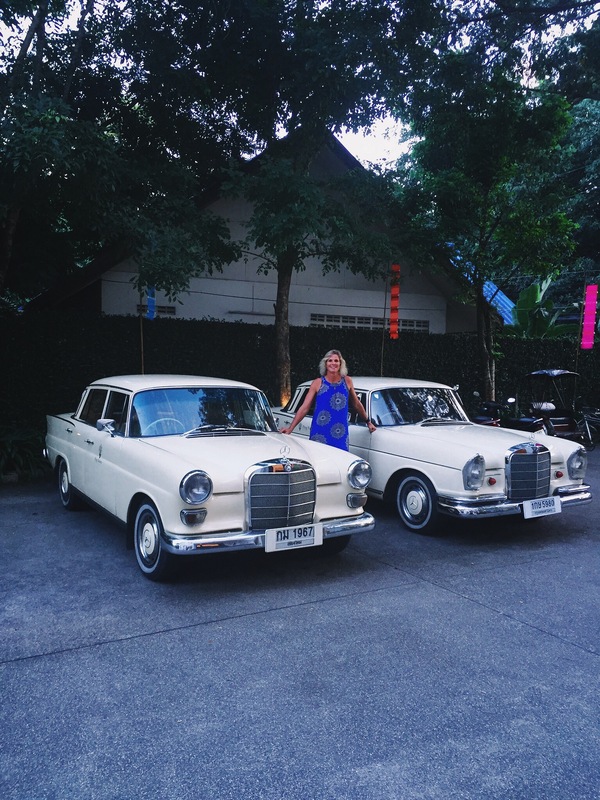 The city sits astride the Ping River, a major tributary of the Chao Phraya River. While officially the city (thesaban nakhon) of Chiang Mai only covers most parts of the Mueang Chiang Mai district with a population of 160,000, the city’s sprawl extends into several neighboring districts. The Chiang Mai Metropolitan Area has a population of nearly one million people, more than half the total of the Chiang Mai Province. Our friends, Daniel and Marc, mentioned above founded Child’s Dream. 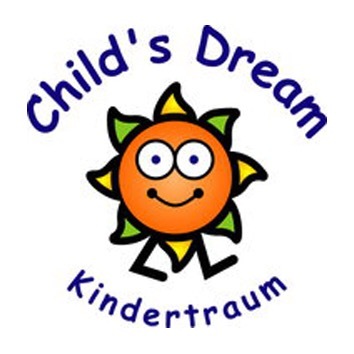 Child’s Dream was established in 2003 as a charitable organisation dedicated to unconditional help for underprivileged children in the Mekong Sub-Region. This region is at the core of many humanitarian crises and children are suffering the most. Our well over 300 projects focus on extremely remote and neglected areas in this region. Our offices in Chiang Mai (Thailand), Siem Reap (Cambodia) and Yangon (Myanmar) serve as bases for our humanitarian and community development activities. Our 40 staff members are dedicated to working in the most efficient and effective way to achieve our mission. Our mission is to empower marginalised communities to shape their own futures. We achieve this by working with communities to improve health care and education for children and provide socioeconomic opportunities for families. We are working towards the second and fourth UN Millennium Development Goal which are universal primary education and reduction of child mortality respectively. 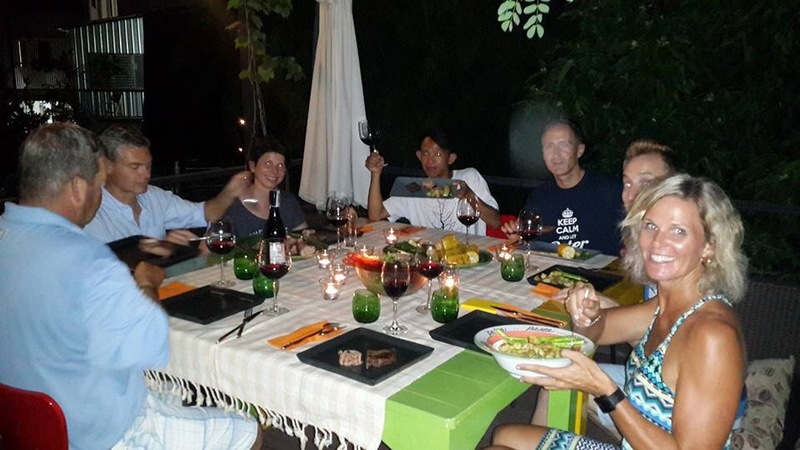 This entry was posted in Chiang Mai, Thailand and tagged chiangmai, childsdream, maengatdam, pingnakara. Bookmark the permalink.